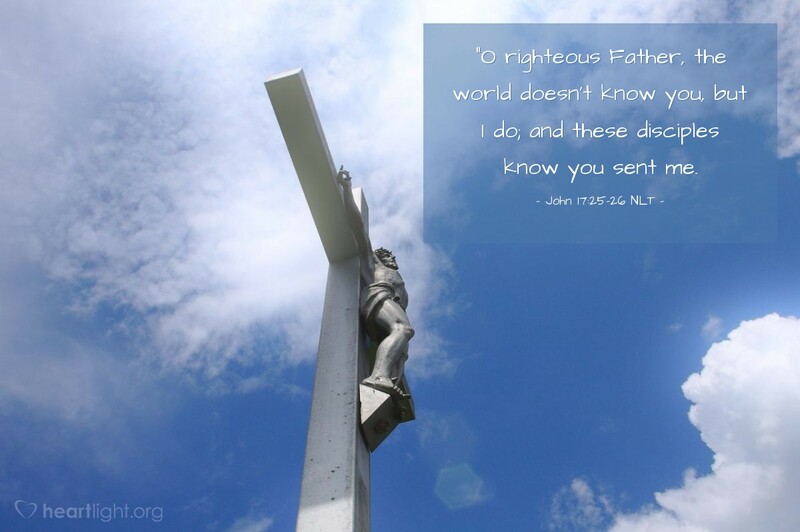 [Jesus prayed,] "O righteous Father, the world doesn't know you, but I do; and these disciples know you sent me. I have revealed you to them, and I will continue to do so. Then your love for me will be in them, and I will be in them." Jesus is the one who reveals the Father to us. If we want to know what the Father is like, all we have to do is look at Jesus. If we want to know how the Father cares for people, we can look at how Jesus ministered to them. If we want to know the Father's will for our lives, we can listen to Jesus' words and know they reveal the Father's truth. Jesus revealed the nature of the Father in his actions and his words. And, Jesus continues to reveal the Father to us. He is the one through whom the fullest revelation of the Father comes. Let's look to Jesus if we really want to know the Father. Father God, thank you for revealing yourself to me in Jesus. I truly believe that Jesus revealed your heart, your character, your compassion, your holiness — all of your qualities. Now I ask, dear Father, that you reveal yourself to me as I seek to know you more fully through your Son's ministry here on earth. Please make yourself more fully known to me and through me. I ask this in Jesus' name. Amen.